With phones, DSLRs, and GoPros Put Your GoPro Camera to the Test with These Creative Ideas Put Your GoPro Camera to the Test with These Creative Ideas A GoPro camera isn't only for those who lead an adventurous life. Even if you don't go skydiving or white water rafting, you can record lots of cool footage with your camera. Read More we’re all shooting more video than ever. But it rarely comes straight out of the camera in perfect shape. Often you’ll need to do a little editing of a video before showing or sharing it. You might want to trim a few seconds off the start or end, or cut it so that it’s a more shareable length. Fortunately, you don’t need any editing skills to do this. You just need the right software — and you’ve probably already got it installed on your computer. So let’s take a look at the quickest way to trim videos in Windows, Mac, Linux, and in a web browser. The quickest way to trim and cut videos in Windows 10 is to the use the built in Photos app. Open your video to get started. You can do this either by launching Photos from the Start menu and navigating your way to where the clip is stored on your hard drive, or by right-clicking the file and selecting Open with > Photos. When the video has opened click Edit & Create in the top right corner of the window then select Trim. The video now reopens in Edit mode. On the timeline at the bottom there’s a blue handle that enables you to scroll through the video, plus two white dots that be used to set the start and end points for your newly trimmed clip. First, drag the left dot towards the right until you reach the point where you want your video to start (everything to the left of this will be cut). Then drag the right dot leftwards to trim off the end of the video. Hit the Play button to preview the changes, and tweak the positions of the white dots to fine-tune your edit. When you’re happy, hit Save as to save the edited version as a new file. By default, it’ll be saved with the same filename with the word “Trim” appended to it. This ensures you never overwrite the original file. And that’s it. 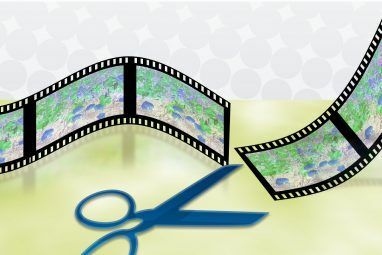 You can split a longer video into two or more shorter clips using the same technique. 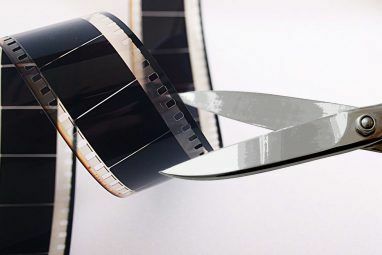 Just repeat the process for each clip, setting different start and end points to isolate the sections you want to save. If you need more advanced editing functions, use the Movie Maker app instead How to Easily Create a Stunning Video Using Windows Movie Maker How to Easily Create a Stunning Video Using Windows Movie Maker Creating a movie using your photos, videos, and music is child's play once you master Windows Movie Maker's simple editing tools. Read More . On macOS you can trim video using QuickTime Player, which is pre-installed on all Macs. Open the video. By default, supported video files open automatically in QuickTime Player. If yours doesn’t, right-click and select Open With > QuickTime Player, or drag the file onto the app icon in the Dock. Next, go to Edit > Trim. You’ll now see the trimming bar at the bottom of the window. Everything inside the yellow section is included in your trimmed video, while everything outside will be removed. Grab the left handle and drag it to the right until you reach the point where you want your video to start. Then grab the right handle and drag it to the left. Hit the Play button to preview your selection, and tweak the handles if necessary. When done, click Trim. The video will now be trimmed, and will open as a new untitled file. Go to File > Save to save the new, trimmed video. For greater control over your editing, use iMovie. This is a free download for all Mac users Download iMovie, GarageBand, Pages, and iWork Free for Mac and iOS Download iMovie, GarageBand, Pages, and iWork Free for Mac and iOS Every Apple user can now download Pages, Numbers, Keynote, Garageband and iMovie completely free of charge, but what are they good for? Read More . If you’re on Linux, you’ll need to find a third party app to trim and split your videos. We recommend VidCutter, which we’ll be using in this guide on Ubuntu. To begin, you’ll need to install VidCutter. How you do this depends on which Linux distro you’re using 6 Linux Distros Designed for Artists, Musicians and Editors 6 Linux Distros Designed for Artists, Musicians and Editors Read More . Check out VidCutter on Github for full instructions for all main distros. To open your file either launch VidCutter and select Open Media, or navigate your way to where the video is stored on your computer. Right-click the file and select Open With > VidCutter. When the video opens, locate the filmstrip at the bottom of the window. Drag the green handle to the point where you want your video to start. Click Start Clip to save that position. Next, drag the green handle to the point where you want your video to the end. Click End Clip to save this position. Now click Save Media to save a copy of your newly edited file. What’s good about VidCutter is that you can make multiple cuts to the same video all at once. 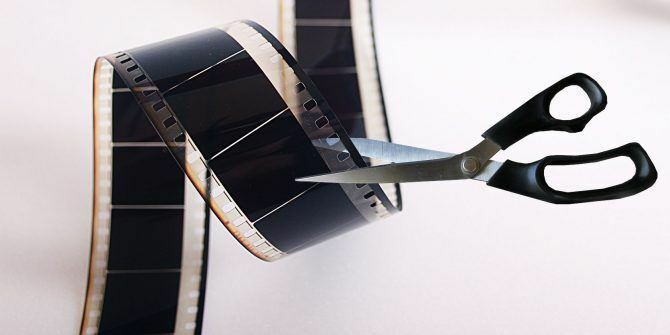 If you want to remove something from the middle of a clip, set two start points and two end points either side of the unwanted portion. Clicking Save Media will then create a new video where the two sections you’ve selected are joined together. If you want more control, check out our guide to the best Linux video editors 7 Free Open Source Video Editors for Linux 7 Free Open Source Video Editors for Linux Video editing on Linux is constantly improving. 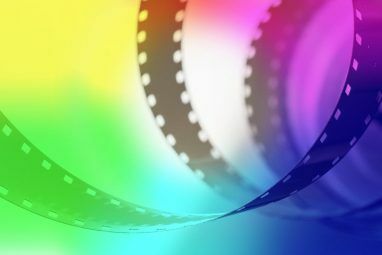 A good selection of open source video editing software is now available to Linux users, and we've got seven of the best for you to check out. Read More . If you’re using a Chromebook, or just prefer to work in the browser on any machine, there are lots of options to trim videos online 3 Ways To Do Video Editing From Within Chrome 3 Ways To Do Video Editing From Within Chrome If you're on a budget and need free video editing options, look no further than these three Chrome apps, compatible with both your browser and Chrome OS. Read More . We’re going to use ClipChamp. This service is good for editing up to five videos per month on a free account. You need to sign up to get started. Fortunately this is painless, since you can log in straight away with your Google or Facebook accounts. Click Convert my video, or drag and drop your chosen clip into the browser window. ClipChamp also optimizes your videos for your target platform, but we need to focus on the trimming first. In the right-hand pane, click Edit Video. A filmstrip appears below the video with two blue flags at either end. Grab these flags and drag them inwards to set new start and end points. Your selected area is shaded blue, and everything outside of this will be trimmed off. There’s no need to confirm your edits at this stage, although you can undo them by clicking the X button alongside the Trim icon. Now take a look at the optimization options in the left part of the screen. You can choose a platform you want to optimize for, such as web, mobile, or to create a GIF. You can also adjust the resolution, file format, and quality. When you’re happy with your choices, click Start in the bottom right corner. It will now start processing; the amount of time it takes depends on the size of the video. When it’s finished you have two options: Upload & Share and Save. The first enables you to post the video to various social media sites. The second lets you download and save a local copy of your edited file. Trimming and splitting videos is easy no matter what platform you’re using. Once you’ve got to grips with it you might be interested in taking the next steps in video editing How to Edit Videos Like a Pro: 8 Tips You Need to Master How to Edit Videos Like a Pro: 8 Tips You Need to Master If you're just getting into the editing game, you may be confused as to what to do with the many millions of clips you have... well, we're here to help. Read More . We’ve got lots of tips for making your videos better, and you can even explore editing videos on Android The 10 Best Video Editors for Android The 10 Best Video Editors for Android Looking for the best video editor for Android? Here are the best video editing apps for Android users. Read More and iOS The 6 Best Free Video Editing Apps for iPhone and iPad The 6 Best Free Video Editing Apps for iPhone and iPad Looking to make some memories from media on your iPhone or iPad? Here are the best free video editing apps for iPhone and iPad. Read More devices too. Have you used any of these apps to trim your videos? Or do you use something else instead? Share your thoughts and comments below. Thanks! Simple and easy to follow. Great website. Many beautiful posts I could learn something. Thanks for the post.